The Week 7 showdown between the Jets (4-1) and Patriots (5-0) features two of the strongest teams in the AFC according to our data. The Patriots are ranked No. 1 and the Jets No. 6 based on our Week 6 BES rankings. Therefore, this will be a much-anticipated clash between two BES powerhouses. OVERVIEW: While the Patriots are the prevailing favorite to win this game, it must noted that their two 2014 regular season encounters with the Jets were decided by a combined three points. Although the Patriots won both of those contests, the Jets team they will face this Sunday looks much different from its 2014 counterpart. Under new head coach Todd Bowles, the Jets made some key moves last offseason. They acquired starting quarterback Ryan Fitzpatrick and receiver Brandon Marshall via trades. Meanwhile, they bolstered their secondary with the free agent acquisitions of cornerbacks Darrelle Revis, Antonio Cromartie and safety Marcus Gilchrist. Along their defensive line they added impressive rookie end Leonard Williams to a star-studded group that includes ends Sheldon Richardson and Muhammad Wilkerson. The Jets fortification of their defense has paid tremendous dividends as they now own the No. 1 BES Defense. The unit has registered a Pass Pressure score of 3.26 which is by far the highest of any team the Patriots have faced this season. This could prove problematic for the Patriots who lost steady left tackle Nate Solder (torn biceps) for the season in Week 5. Conversely, the Patriots No. 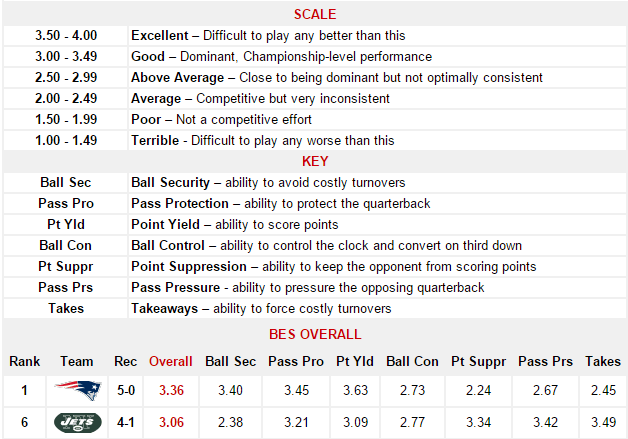 1 BES Offense, led by three-time Super Bowl MVP quarterback Tom Brady, will have to be ultra-efficient and smart with the football. Their Ball Security score of 3.40 will be key as any uncharacteristic mistakes could be capitalized upon by a crafty, No. 7-ranked Jets offense. The Patriots defense ranks a league 22nd against the run, permitting 114.6 yards per game on the ground. 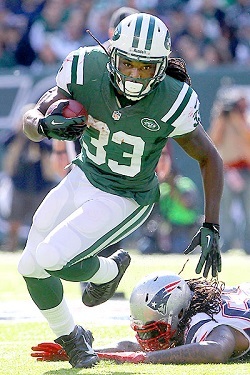 They will have to concentrate on stopping Jets halfback Chris Ivory who ranks third in the league with 460 rushing yards, averaging 5.5 yards per carry. At 6-feet and 220 pounds, Ivory is a punishing runner that can wear down the Patriots No. 14-ranked BES defense if the game is close or the Jets have a lead. A dominant performance by Ivory would greatly aid the Jets in landing a pivotal win in a tightly contested AFC East.